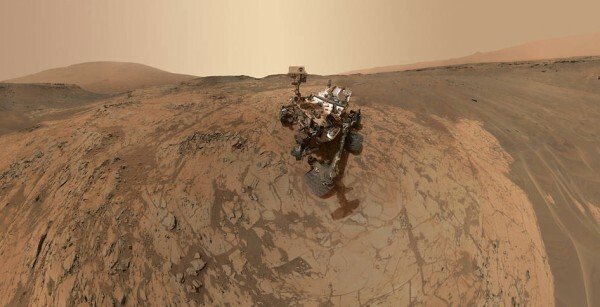 This self-portrait of NASA’s Curiosity Mars rover shows the vehicle at the “Mojave” site, where its drill collected the mission’s second taste of Mount Sharp. The scene combines dozens of images taken during January 2015 by the Mars Hand Lens Imager (MAHLI) camera at the end of the rover’s robotic arm. The pale “Pahrump Hills” outcrop surrounds the rover, and the upper portion of Mount Sharp is visible on the horizon. Darker ground at upper right and lower left holds ripples of wind-blown sand and dust.